Oman is considered a hidden jewel of the Arabian Peninsula with wonderful combination of ageless heritage and modern life. A place where one can play golf at Greg Norman designed Al Mouj golf course in the morning, explore a traditional souq in the afternoon, and attend a world-class show at the renowned Royal Opera House Muscat in the evening. A large part of Oman’s unique charm is the hospitality of the Omani people. It is common for visitors to be invited for Omani coffee and dates by locals when travelling through the country. Oman has seen a significant increase in golf tourism off the back of two successive hosting of European Tour events – Oman Open, with guests flying in to Muscat International Airport from across the globe to play at one of the many courses the capital Muscat has to offer including European Tour host venue Al Mouj Golf, Ghala Golf Club, Muscat Hills Golf & Country Club and Ras al Hamra. “This season we have seen the number of golf visitors more than double with groups from France, Germany, Poland and India as well as many FIT clients. 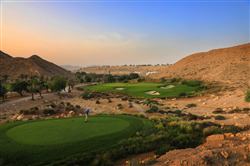 With its brand new Muscat International Airport that is surrounded by four beautiful golf courses each with unique setting and all within 15-20 min drive as well as a wide range of international hotels chains, Oman has emerged as a favorite golf destination in the Gulf” said Salim Al Harthy, CEO of Arabian Greens Tours - the only dedicated golf DMC in Oman.